Catherine Stecyk, Assistant Director for Undergraduate Research; the Rev. 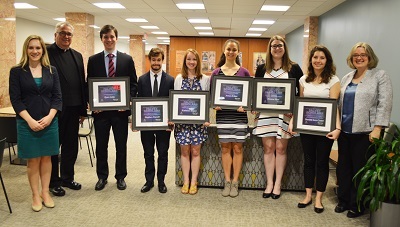 Peter M. Donohue, OSA, PhD; Ryan Zalla; Stephen Purcell; Kathleen Boyce; Anna Briker; Emma Max; Danielle Sens-Castet; Millicent Gaskell, University Librarian. On Friday morning the 2017 Falvey Scholars shared their research with an attentive audience. Millicent Gaskell, University Librarian, was the emcee and award presenter. Craig M. Wheeland, PhD, Vice Provost for Academics, welcomed the attendees. Scholars were introduced by their mentors. Following their presentations scholars answered questions posed by the audience. The Rev. Peter M. Donohue, OSA, PhD, gave the closing remarks. Scholars’ certificates designed by Joanne Quinn, Falvey’s graphic designer. Photograph by Alice Bampton, Communication and Marketing Dept.